SACRAMENTO, Calif. (CN) – Certain that the Trump administration would soon auction off chunks of federal land in California to oil companies, California lawmakers in 2017 scrambled up a defense. They passed a first-of-its-kind law allowing the state to freeze certain sales it doesn’t agree with by granting regulators right of first refusal on transfers of federal land to private buyers. The bill’s Democratic author warned there was a “real possibility” that the feds would sell off parts of Yosemite National Park or jump start new logging projects in Redwood National Park, and a host of environmental groups hopped on board. “With unprecedented attacks coming from the Trump administration there has never been a more important time to defend our open spaces,” said the California League of Conservation Voters after Senate Bill 50 was passed last fall. But the Trump administration, no stranger to lawsuits involving California, accused Gov. Jerry Brown of enacting a law that explicitly “frustrates federal policy.” Attorney General Jeff Sessions argued that SB 50 wasn’t stifling sales of majestic and undeveloped land to oil barons, but routine transfers of old Naval property and warehouses at taxpayers’ expense. On Thursday, a federal judge agreed with Sessions and ordered the state to nix the law and quit interfering with the feds’ right to sell its own property. Sessions filed the lawsuit in federal court in Sacramento in April, just weeks after suing in the same court over California’s new state immigration laws. Sessions complained that the Department of Justice was once again spending “valuable time and resources” to fight an overzealous California state law. The complaint noted six planned sales of federal land to private buyers that federal officials claim have been nixed or delayed by SB 50 since it went into effect Jan. 1, including a $38 million sale of Navy property in Alameda and a 5-acre parcel of public land in Santa Barbara County. The feds argued in court that the law was scaring away potential buyers by forcing them to abide by more state regulation. 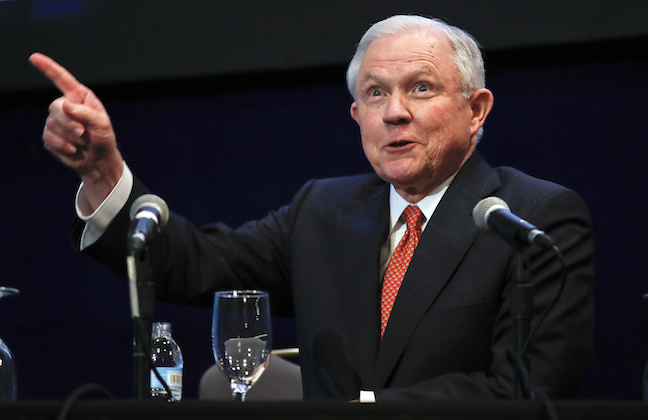 “This was a stunning assertion of constitutional power by California, and it was properly and promptly dismissed by the district judge,” Sessions said in a statement. Under the short-lived law, the state could fine buyers $5,000 for attempting to register a deed without first obtaining a certificate of compliance with the State Lands Commission. In order to gain the certificate, the federal government must first provide the lands commission with refusal rights. Backers intended for the refusal clause to give the state the opportunity to sniff out deals with oil and mineral companies and allow the state to nix or potentially buy the property instead. The federal government controls 45 million acres in California, more than 45 percent of the state’s total acreage. Although the state never exercised its right of refusal to purchase public land or issued a fine to a third-party over the last 11 months, the court still took issue with the statutory threat of buyers being punished. Judge Shubb, a George H.W. Bush appointee, said the law was an unconstitutional hassle for buyers and closed the case. He granted the feds’ motion for summary judgment and permanently enjoined California from enforcing the law. “SB 50 uncritically uses federal administrative and institutional categories to target the federal government and those with whom it deals for regulation,” the 18-page ruling states. The lands commission declined to comment on the ruling, adding that it’s still analyzing the decision and whether to appeal by a Dec. 31 deadline.